I actually started my career as a wildlife photographer, and spent countless hours photographing snow geese at Gray Lodge Wildlife Area north of Sacramento, California, and at Bosque del Apache National Wildlife Refuge in New Mexico. In more recent years I’ve concentrated on photographing landscapes, but occasionally I’ll point my lenses at animals if the opportunity presents itself. Yesterday my wife Claudia and I rose early and drove to nearby Merced National Wildlife Refuge. The fog was dense—typical winter conditions in California’s Central Valley. This was just what I was hoping for, as I envisioned photographing geese enveloped in mist. Most of the geese at this refuge are actually Ross’ geese, smaller cousins of snow geese with nearly identical appearance and behavior. The fog made it difficult to see the birds at first, so we were guided by sound. Standing along the tour road at one place I could hear geese, but couldn’t see them. 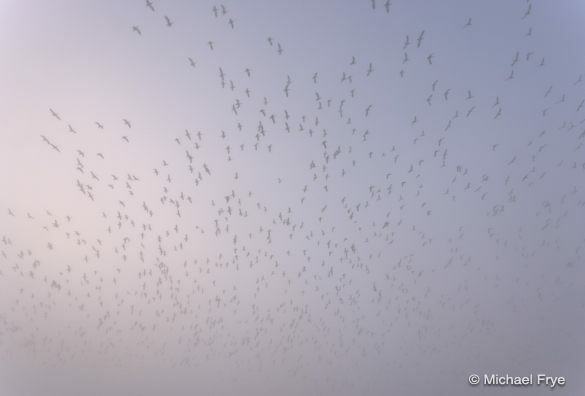 The sound got closer, and closer, until finally a flock appeared through the fog, then disappeared just as quickly. Another flock appeared, then disappeared. We seemed to be underneath a flight path between feeding grounds. Later the fog lifted a bit, and we spotted about 500 white geese feeding in a field. Soon another group flew in, circled, and landed. Then another group arrived. And another. And another. 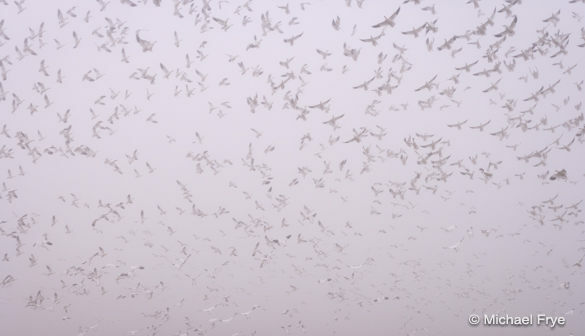 A large flock of perhaps 2,000 birds arrived, circling, spinning downward, filling the air with fluttering wings, a Merced blizzard. Soon the field was filled with about 5,000 geese, eventually growing to maybe 10,000. And they were moving closer. When we first spotted them the birds were perhaps a quarter of a mile away. But as they fed they moved right towards us. We stayed in the car to avoid spooking them, and soon thousands of geese surrounded us on three sides. I photographed groups coming and going, and waited. Eventually, inevitably, something spooked them, and we got to witness one of those amazing mass takeoffs. Bosque del Apache refuge in New Mexico is a well known hot spot for snow goose and sandhill crane photography, attracting, in winter, more long lenses per square mile than perhaps anyplace in the country. And for good reason: the birds roost in ponds right next to the tour road, and are quite accustomed to people. Photographing snow or Ross’ geese in California’s Central Valley at refuges like Merced, Sacramento, and Gray Lodge is more hit-and-miss. The birds usually roost in ponds that are not particularly close to the tour routes, so you have to get lucky and find them feeding near a road. But when that happens the sights, sounds, and photography can be spectacular. 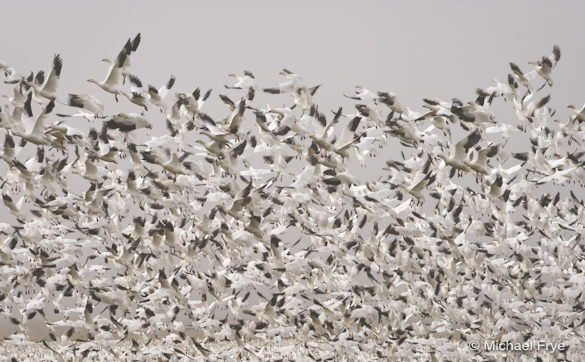 Have you ever seen or photographed snow or Ross’ geese? I hope some of you have. They winter in many parts of the country, not just California and New Mexico. Unlike viewing Half Dome, which is always visible unless obscured by clouds, seeing geese, and witnessing one of those mass takeoffs, requires patience and a little luck. But it’s well worth the effort.